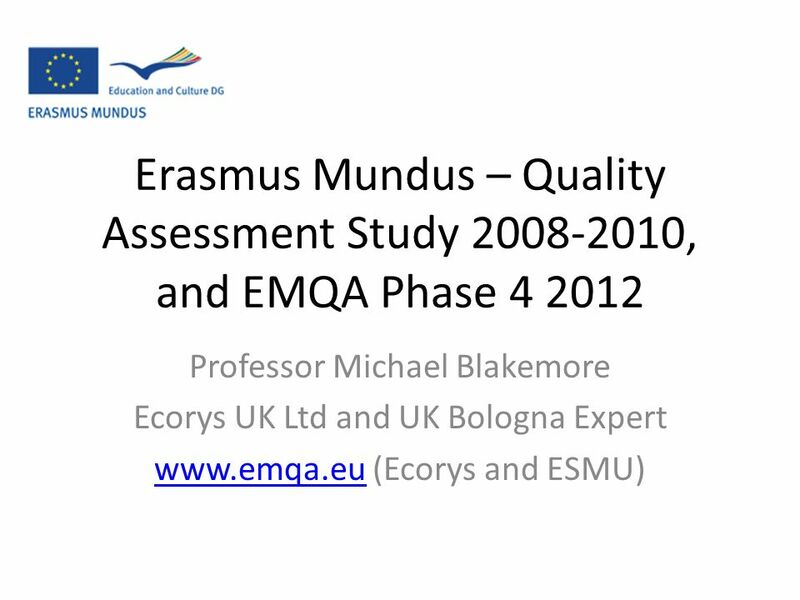 Erasmus Mundus – Quality Assessment Study 2008-2010, and EMQA Phase 4 2012 Professor Michael Blakemore Ecorys UK Ltd and UK Bologna Expert www.emqa.euwww.emqa.eu. 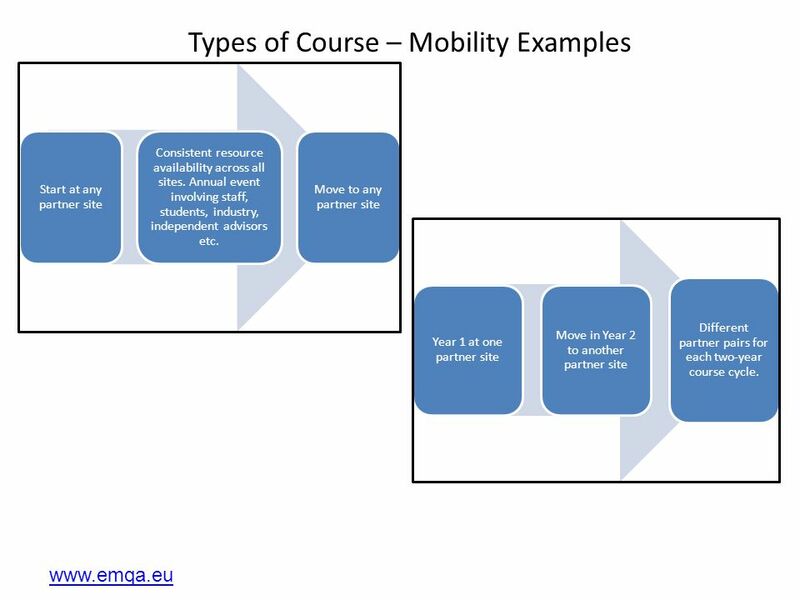 18 www.emqa.eu Types of Course – Mobility Examples Start at any partner site Consistent resource availability across all sites. 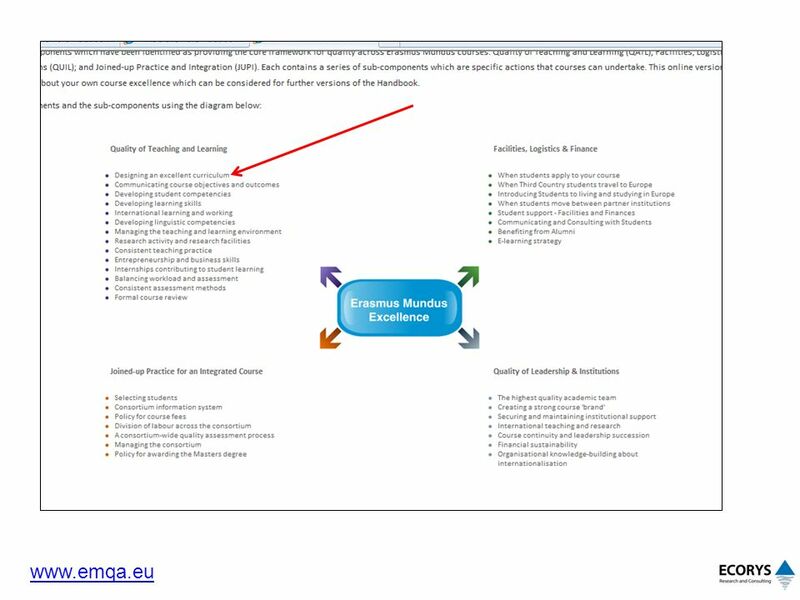 Annual event involving staff, students, industry, independent advisors etc. 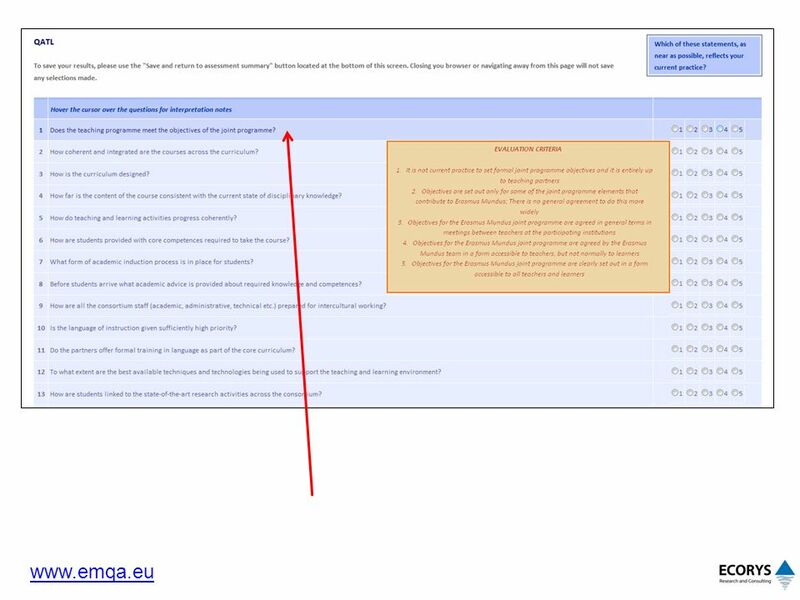 Move to any partner site Year 1 at one partner site Move in Year 2 to another partner site Different partner pairs for each two-year course cycle. 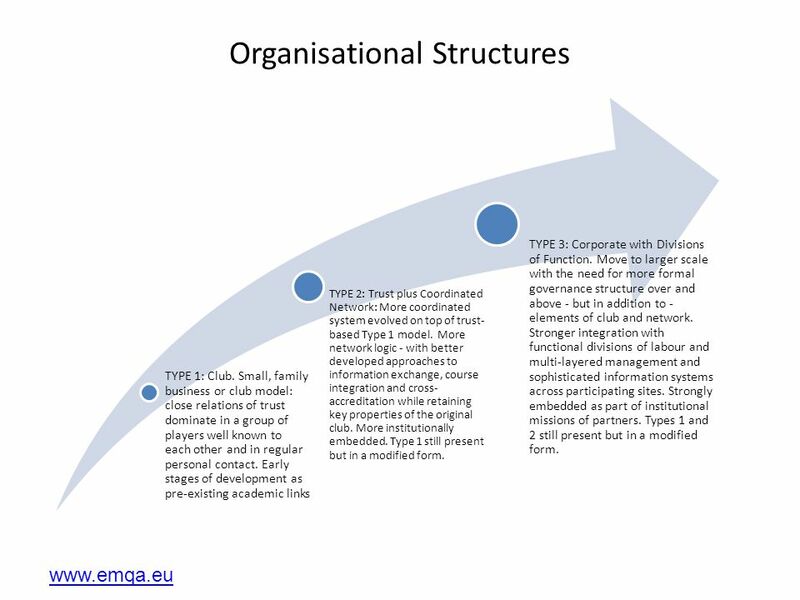 19 www.emqa.eu Organisational Structures TYPE 1: Club. Small, family business or club model: close relations of trust dominate in a group of players well known to each other and in regular personal contact. 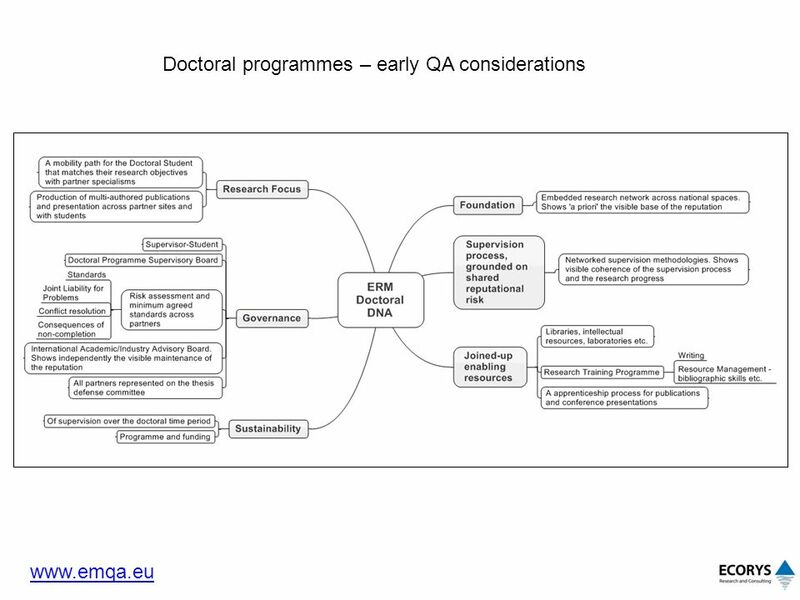 Early stages of development as pre-existing academic links TYPE 2: Trust plus Coordinated Network: More coordinated system evolved on top of trust- based Type 1 model. 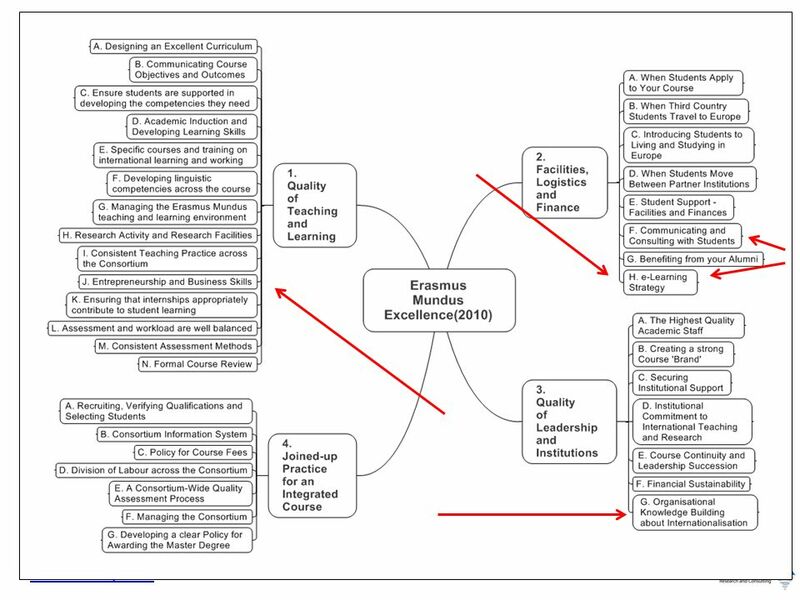 More network logic - with better developed approaches to information exchange, course integration and cross- accreditation while retaining key properties of the original club. 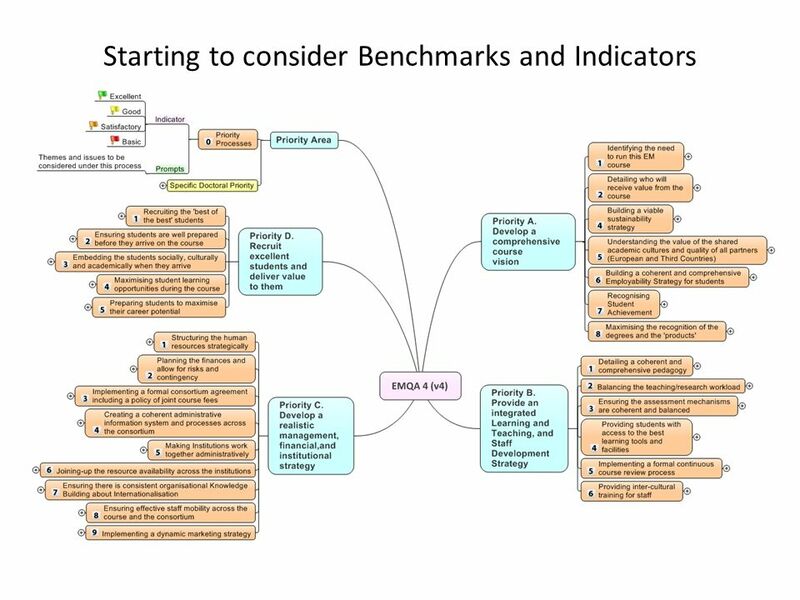 More institutionally embedded. Type 1 still present but in a modified form. 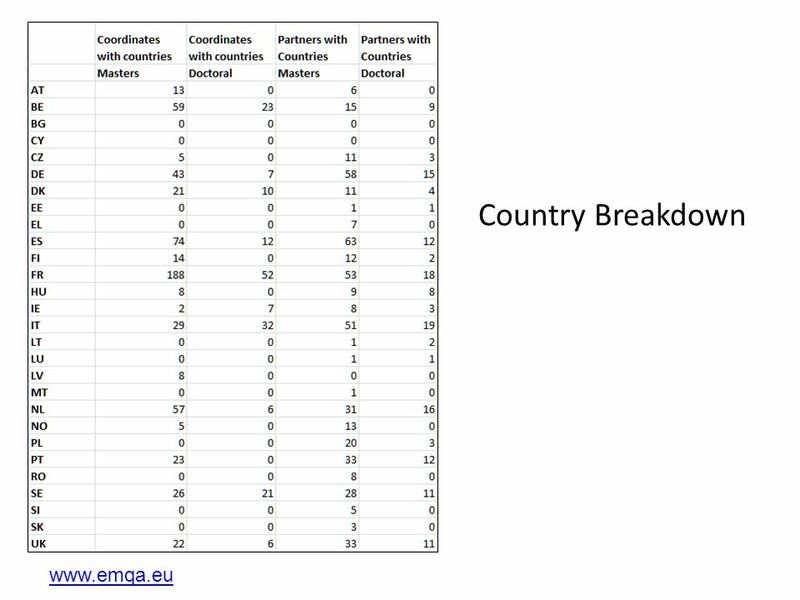 TYPE 3: Corporate with Divisions of Function. 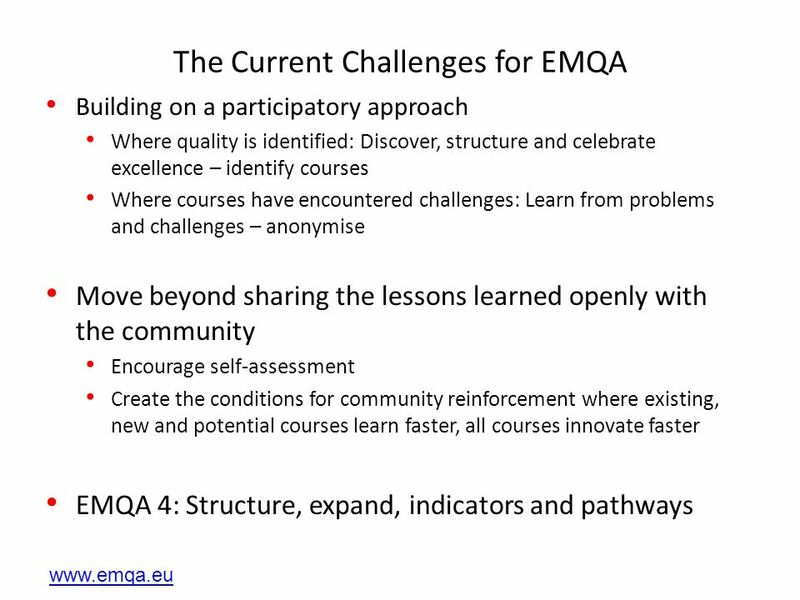 Move to larger scale with the need for more formal governance structure over and above - but in addition to - elements of club and network. 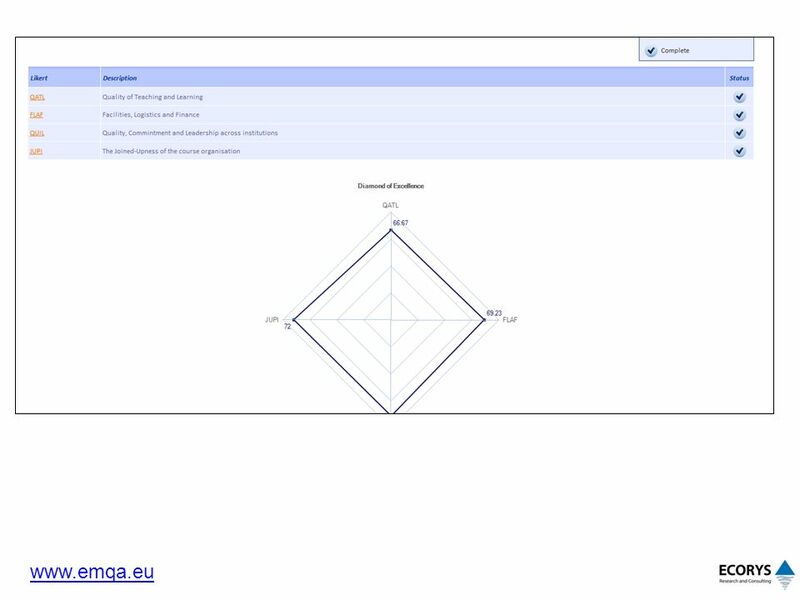 Stronger integration with functional divisions of labour and multi-layered management and sophisticated information systems across participating sites. 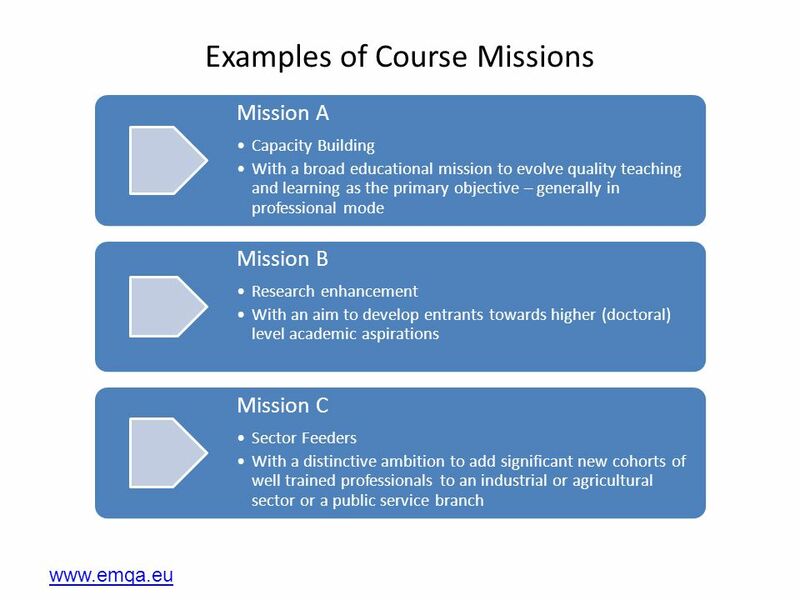 Strongly embedded as part of institutional missions of partners. Types 1 and 2 still present but in a modified form. 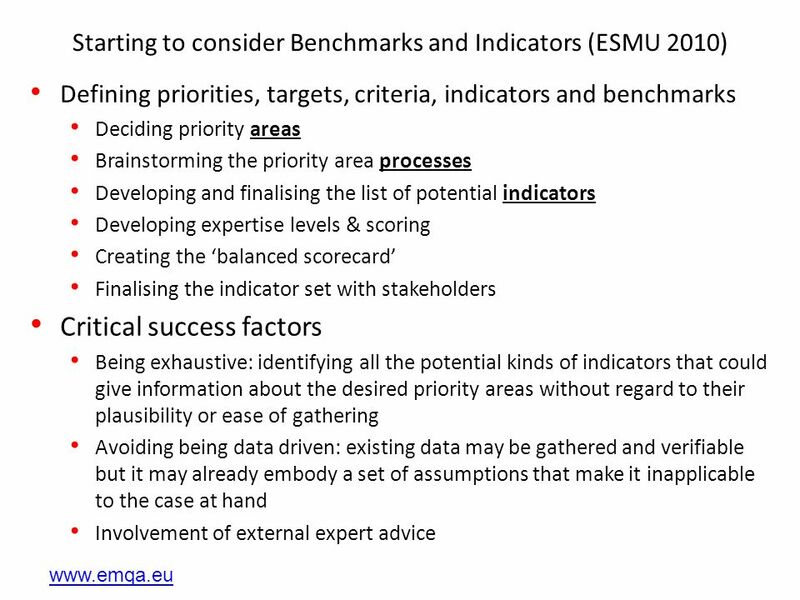 Download ppt "Erasmus Mundus – Quality Assessment Study 2008-2010, and EMQA Phase 4 2012 Professor Michael Blakemore Ecorys UK Ltd and UK Bologna Expert www.emqa.euwww.emqa.eu." 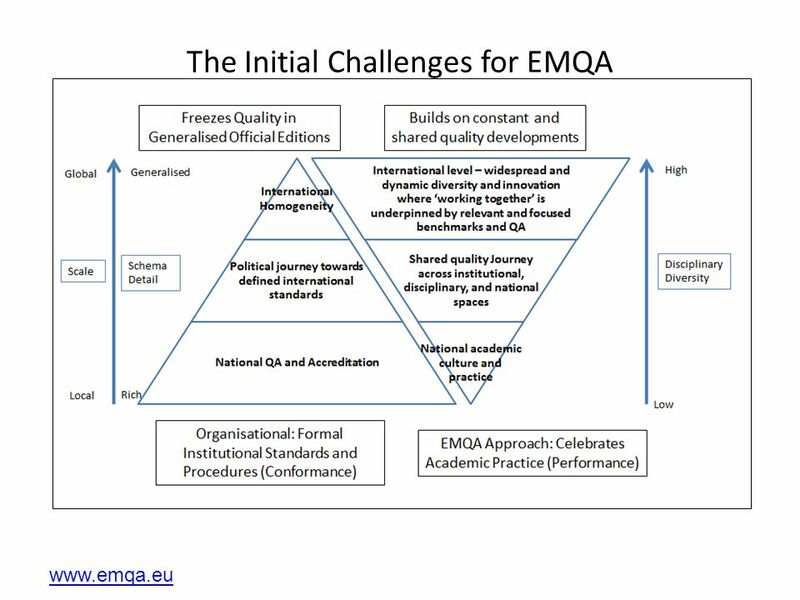 London, first of December 2008 Quality Assurance in Higher Education Bruno CURVALE Head of International Affairs at AÉRES Agence dévaluation de la recherche. 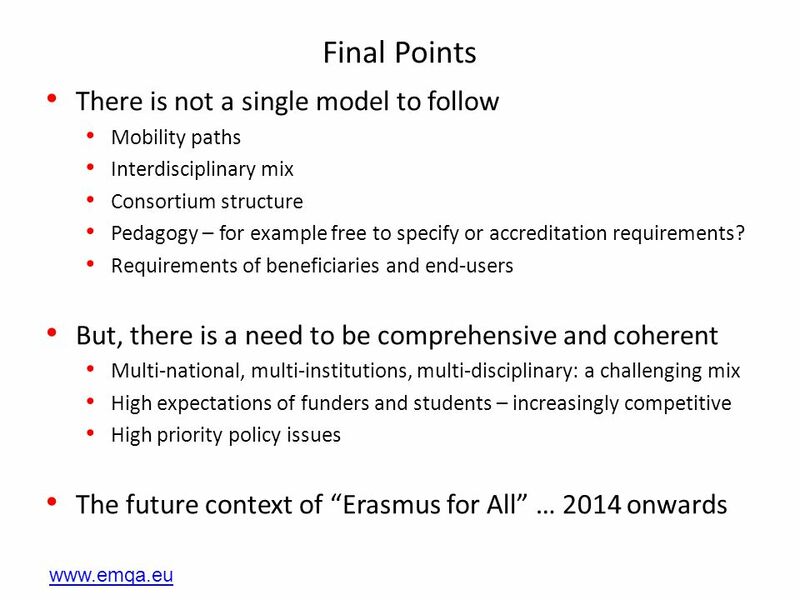 Report of Working Session 3 Bologna Conference Fostering student mobility: next steps? 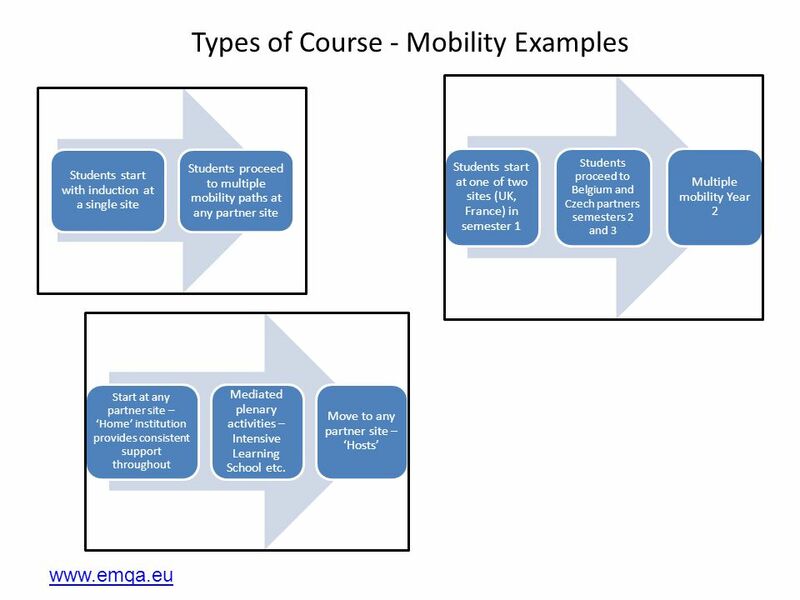 Fostering student mobility: next steps? 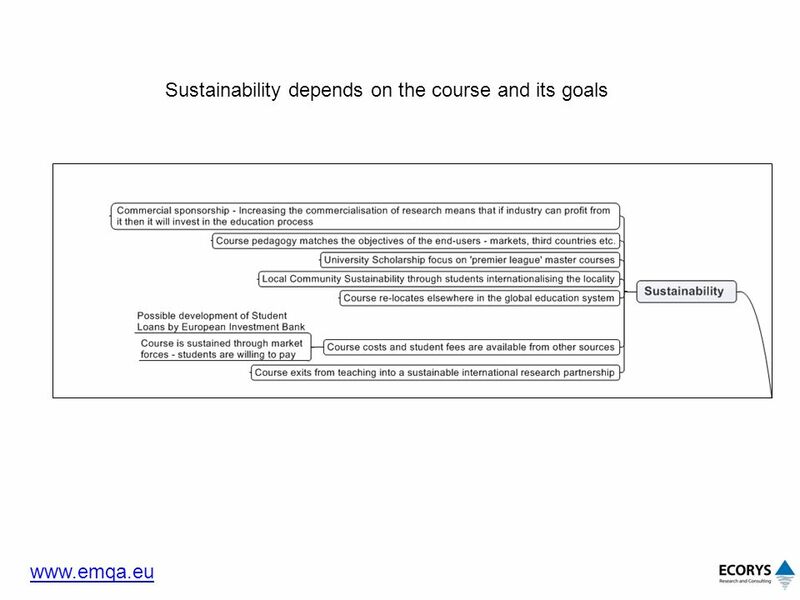 Involving stakeholders for. 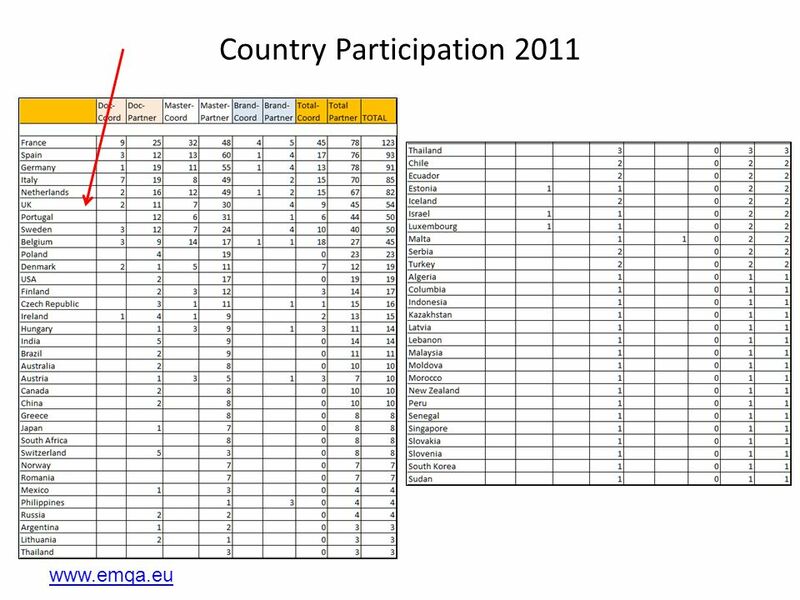 Workshop on Sector Approaches in the Context of EU Integration Sarajevo, Bosnia and Herzegovina March 2010 Debriefing of the Workshop on Sector Approaches. 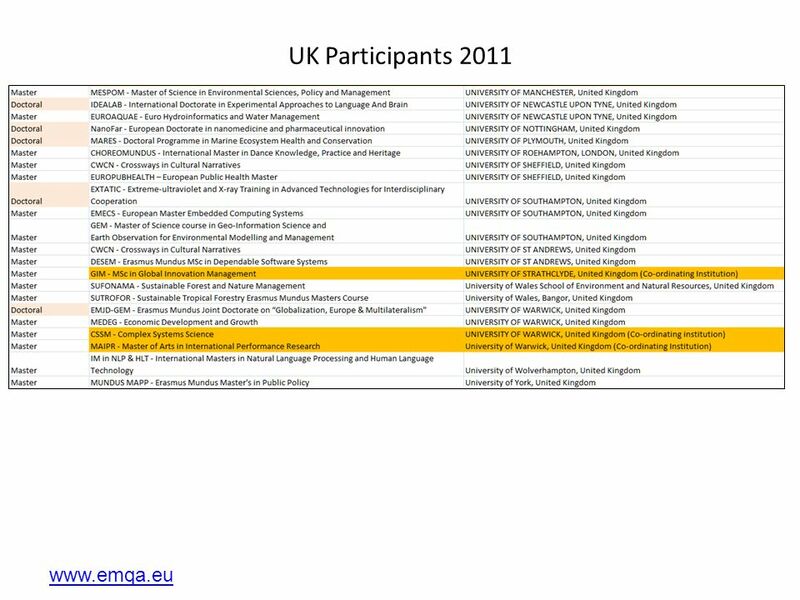 RESEARCH AFTER REF Ian Greer University of Liverpool. 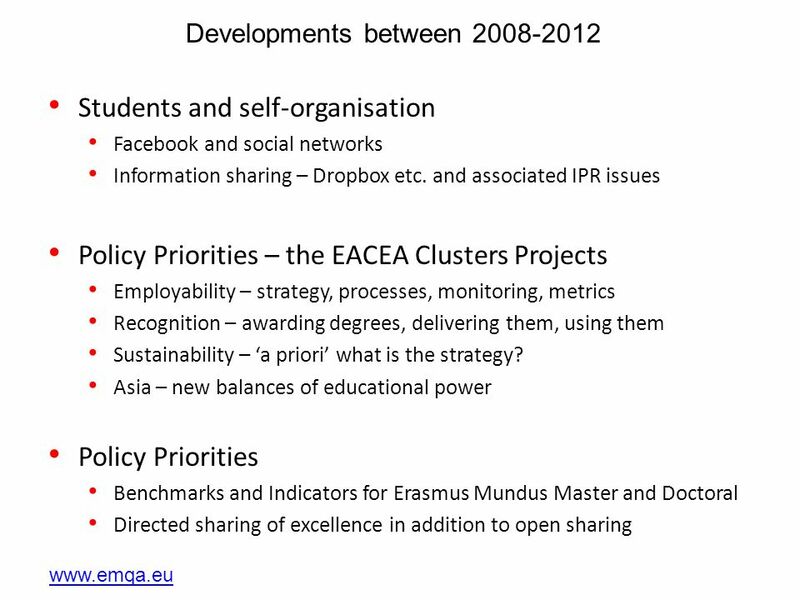 Date: in 12 pts Education and Culture Erasmus for All: New opportunities for Higher Education. 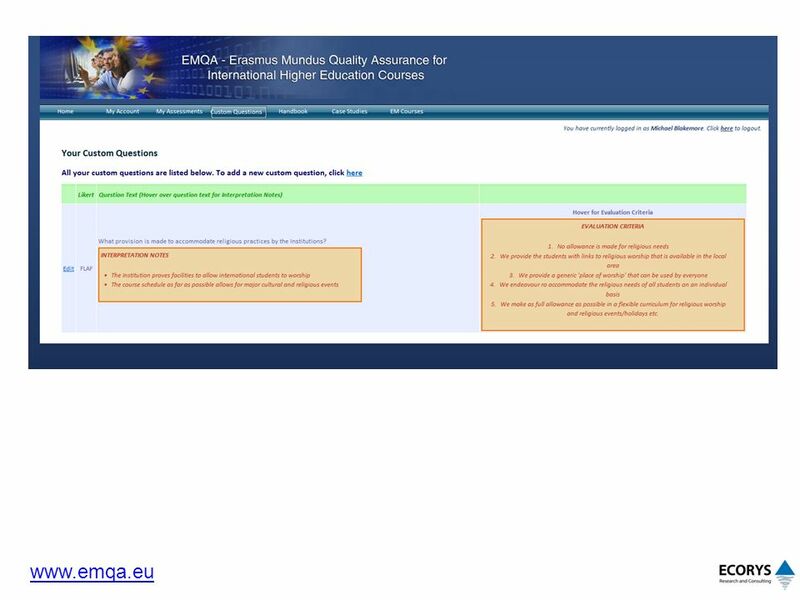 An Overview of Quality Assurance in the EHEA by Prof. Andreas G. Orphanides President of EURASHE, Rector of European University Cyprus, and Ex-President. 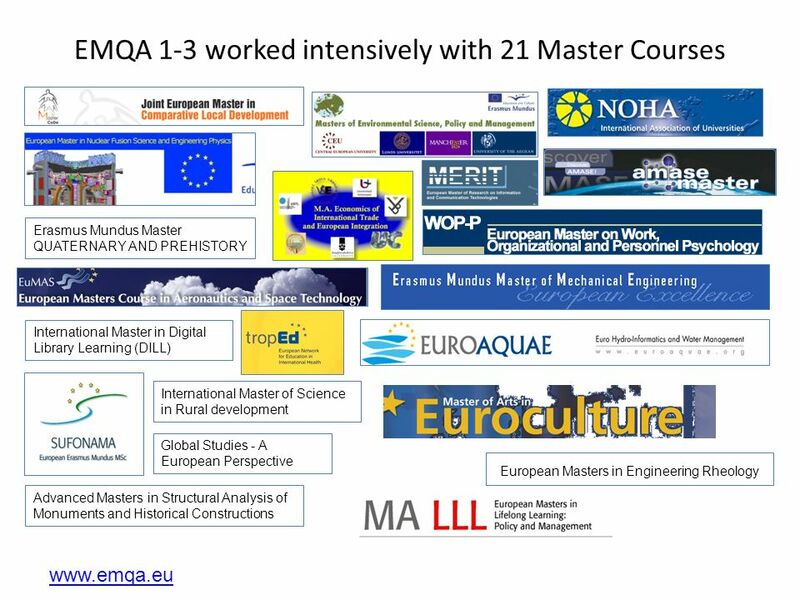 Educate to Innovate A SusChem programme for building skills capacity for a sustainable European chemical sector Susan Fleet - Britest Limited Professor. 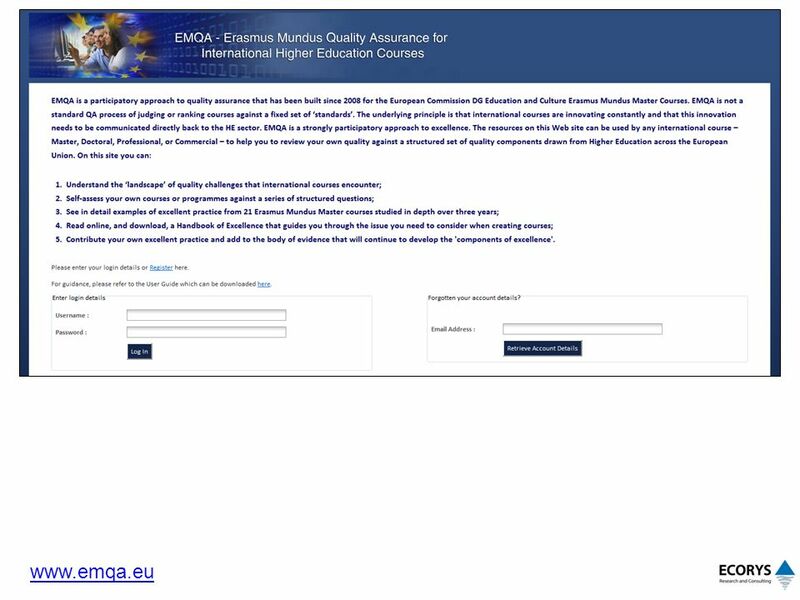 ERASMUS MUNDUS. 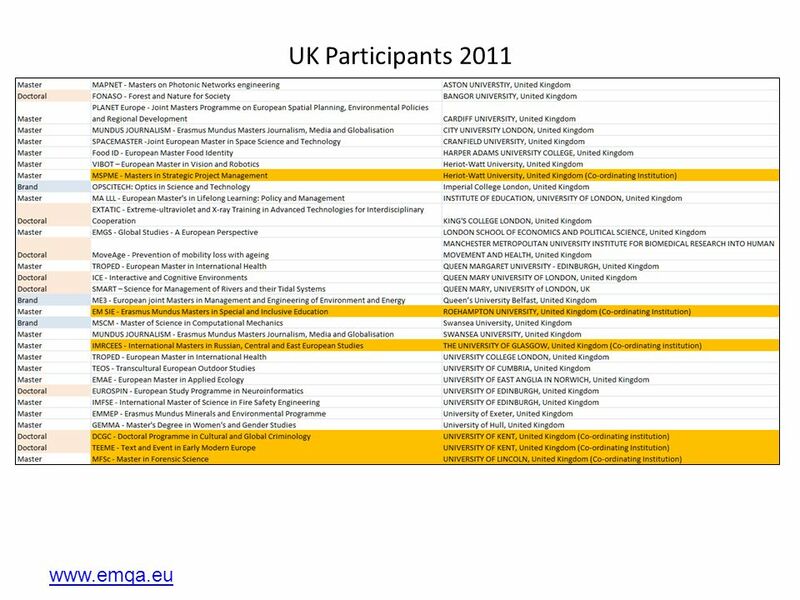 Genesis Article 149 of EC Treaty: enhance quality education Political aims: Lisbon, Barcelona, Bologna... Communication on reinforcing.